Shore Vascular & Vein Center, the region’s leader in laser tattoo removal Ocean County NJ, is pleased to be the first center in the entire Delaware Valley to offer the brand new, Enlighten III laser! Back in 2015, they were the first center to offer what was, at that time, the latest picosecond laser, Enlighten. Now, for the first time ever, the developers of the original Enlighten laser have created Enlighten III. This new laser adds a third wavelength for improved removal of some of the most difficult tattoo colors. Once again, Shore Vascular & Vein Center is on the cutting edge of providing this brand new and improved technology to their patients. How Does the Enlighten III Work? Enlighten III combines 3 different laser wavelengths, along with both picosecond and nanosecond laser technology. This provides for the most complete laser tattoo removal Ocean County NJ available. It is the equivalent of having 5 different lasers available to treat tattoos of all colors, on all skin types. No other laser provides these 3 unique laser wavelengths combined in one unit. 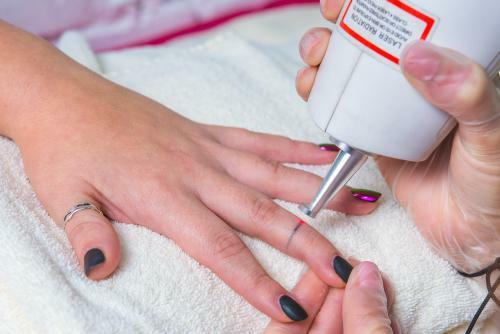 This means people seeking tattoo removal can now expect to obtain markedly improved results in treating tattoos of multiple colors. Even the typically difficult colors to treat, such as green, turquoise and blue. Furthermore, just like its predecessor, Enlighten, the Enlighten IIIlaser will treat tattoos of the most common colors. It will be able to do so more completely, and in fewer treatments than with other lasers. That means less time, less cost and less pain for the individuals receiving the treatment than with other lasers. Another advantage to Enlighten III is that each treatment session will be faster and easier than with previous methods. When various tattoo characteristics need to be treated, such as color, density, or shade of ink, the doctor is able to simply adjust the laser settings, to obtain the best possible results. Therefore, most treatment sessions (depending on size of tattoo) are able to be completed in 10 minutes or less. In addition to offering the latest, most advanced laser technology, Shore Vascular & Vein Center offers free initial consultations for laser tattoo removal Ocean County NJ. At that consultation, individuals will personally meet the doctor and have his or her tattoo evaluated. Individuals will also be given expectations for the amount of treatments needed, as well as the cost of treatment. Various treatment packages are available, which offer significant discounts on the price of treatment. At Shore Vascular & Vein Center, all laser procedures are performed by a Board Certified Surgeon, using the most state-of-the-art laser technology. They have been proudly serving residents of Atlantic County, Cape May County, Ocean County, Cumberland County, Camden County, and the surrounding southern New Jersey region for more than 20 years. If you are experiencing tattoo regret, call (609) 927-3030 today for a free consultation. Learn about how to have your tattoo safely and permanently removed using the latest Enlighten III laser.